I was setting up the studio earlier today ready to start on a painting. I’ve got three on the go at the moment, and they all need final details. I wasn’t in the mood for any of them today. One thing I’m learning is, if the energy isn’t aligned for a certain painting then something else is calling, save that one for the day that it calls to you. Admittedly, when you have a deadline that’s not always possible, but when it’s a free studio day it’s always good to work with intuition. I started working into this painting, the blue portrait. When every piece is planned and I know what the outcome will be before it is finished it is boring and almost suffocating. I know this. Being able to take risks keeps one moving forward. If you’re always within your comfort zone, then you can’t grow. I know I can paint a portrait, but pushing it to the next level is where I want to go. Taking a risk on a painting that I love will be where the magic happens…I know it. The lesson is not to feel bad if it doesn’t work. The more mistakes made the easier it will be to make them! therefore, exploring new territory. It has to be done! When it feels like it isn’t working, keep the faith, keep going, push through, and you’ll arrive at something that is working. I was listening to Abraham Hicks, an inspirational speaker, who discusses lots of ideas around the law of attraction. She usually discusses these ideas in a conversation with somebody asking a question they have regarding their own situation. One person had said "I want my business to expand and to be really successful" and she replied "yes, but are you ready to receive"
I thought about it for a while and how that comment applied to my own practice. There is a distinct difference between hoping something will happen, and really knowing something will happen. In some respects 'hoping' can seem a rather passive approach, whereas 'knowing' has so much more power behind it. I thought to myself If I truly knew what I desired was definitely going to happen, I would have all the necessary tools in place to receive. For example, I've finished a new series of artwork. I imagined them selling, but, at the same time, focused on the many hurdles (that need not be hurdles, but that's another blog post!) like: Where will I store them? shall I print on demand? I don't drive yet, how will I pick them up? Is this cost effective? So, if this sort of chatter is going on it's a massive block on the energy that creates excitement and motivation. Every time a sale comes in am I feeling excitement and gratitude? Have I got everything in place to make this easy for myself, like, all the necessary packaging equipment, the artwork itself, and most importantly, the belief in the work. It's good work, and it will sell. This was a bit of a lesson. Now, if you're an artist wanting to sell your work these are some helpful tips that have helped me. 1. - Get clear on your desire. What is your goal? Write this down. The act of writing it down can really help fine tune what you want and give yourself clarity. You might find your desire changes a bit and that's okay. The clearer you are on what you want, the easier it will be to make it happen. When you get that impulsive feeling and genuinely want to create the work, it will be your best stuff. The energy you put into it shows in the artwork. You'll have an audience that love what you do, you just have to find them. Thrash this out a little. You know when you have your desire, it's a great idea, then your inspiration dwindles. Why is that? The internal chatter that is a bit fearful is talking you out of it and placing a few hurdles in your path. Again, write this down. Write a list of all your concerns. e.g. I might not make a profit. I can invest in myself. The cost is worth it to create good quality work I'm proud of. I can adjust my prices as I grow, it's all a learning curve. There is an audience that will love what I do, I will find them in time. You get the idea. Look at this list every time a new doubt creeps in. It's totally normal to have these fears, it's just a matter of practice to handle that fear in a different and more helpful way. You can add to the list and add new solutions each time. I would recommend sticking this up on a wall in your studio so you can see it. Get a plan chest to store my artwork in. Run regular promotions on social media to let people know what stock I have available. Also, Don't give up! Own a new energy that shows up everyday and matches your desire. Don't forget to notice your progress. Most importantly, ENJOY THE JOURNEY! It's often more rewarding than the outcome! Describe what is it like in a typical day of your life. Well, my studio is in my house, and even though it is super nice to work from home, it does come with distractions! I also try to schedule in proper breaks, as it's easy to find yourself working all day and night otherwise. I often start the day off with a run and a good breakfast. It really clears my head and gets me feeling ready for the day. Then, typically, I'll do I'll my admin bits and pieces and paint in the afternoon. That said, I try to be pretty flexible in terms of what I do when. I find when action comes from an inspired place it just flows like water, that's a good feeling. Less efforting, more flow! Why did you choose to be an artist? From a young age I always enjoyed being creative. I loved drawing, painting, creating pieces of art. I remember finding some water soluble pencils when I was about 4 and thought that were actually magic! naturally, I drew all over my skin rather than paper! I think expression through creativity is something I've always been guided towards and still am now. Sometimes it feels like it was a conscious choice, other times it feels as if I was (and still am) being gently prompted towards an artistic pathway. How did becoming an artist affect your life? I think being an artist is always there, in lots of us perhaps. I think part of the key is if it becomes your full time job, to keep it magical. The magic is what new creations feeds off. I still find now that I have to check in with myself and make sure I'm keeping the balance. What did you do to become an artist/what training or education did you need? I started with an art and design BTEC at a college in Bristol, and then went on to study Graphic Design. I actually worked as a graphic designer for about 8 years and still do freelance work now. I suppose my work has naturally evolved into a more illustrative practise. I'm self taught as a painter, but I find the graphic design heavily influences my work in terms of colour and composition. How do you feel about the starving artist stereotype? I think it puts a lot of people off from pursuing their dream. If you believe something enough, even a stereotype like this one, there is a good chance that will be the story you tell and therefore the reality you experience. If you're open to telling yourself it's possible, listening to the cues that life is always presenting to you, keeping an open mind and not tying yourself to time limits then you can tell a different story. .Do you have any advice for becoming an artist? Get clear on your goals. Ask yourself this: What do you really want? and Why do you want it? The 'why' helps you work out where your desire to become an artist is coming from. Is it from the core of who you are, which will give you the determination and strength to fulfil any challenge that you meet along the way to your goal. If it is more ego based, wanting approval, acceptance, self worth etc, Then you may fall off the path a little and give up too soon. I remember speaking with an artist who is now making a living through his art. It took him fifteen years. How many people would say it isn't working and succumb to the 'starving artist' mindset and give up after five years, two even! If you want to be an artist and it is in alignment with your truest desire, then you are an artist now! Enjoying the journey is one of the biggest pieces of advice. Enjoy it by knowing you will reach your goal, but getting there is just as delightful as the outcome. What is your favourite part about being an artist? Having a vision, creating it and bringing it into existence. A thought or an idea that turns into an object that everyone can see and experience is pretty magic! How do you balance being an artist with your normal life? How does art benefit society? Why are artists important? Art, in varying forms, feeds the soul. It can ignite a spark in us, move us, or just bring us joy. It can be a powerful communicator as person speaking any language can share a piece of art and interpret it in their own way. Freedom - The state of being alive. The vital breath, breath of life. This piece is the precursor of more to come. It explores the concept of life, soul and the self. The blurred boundaries of physical form and the soul. 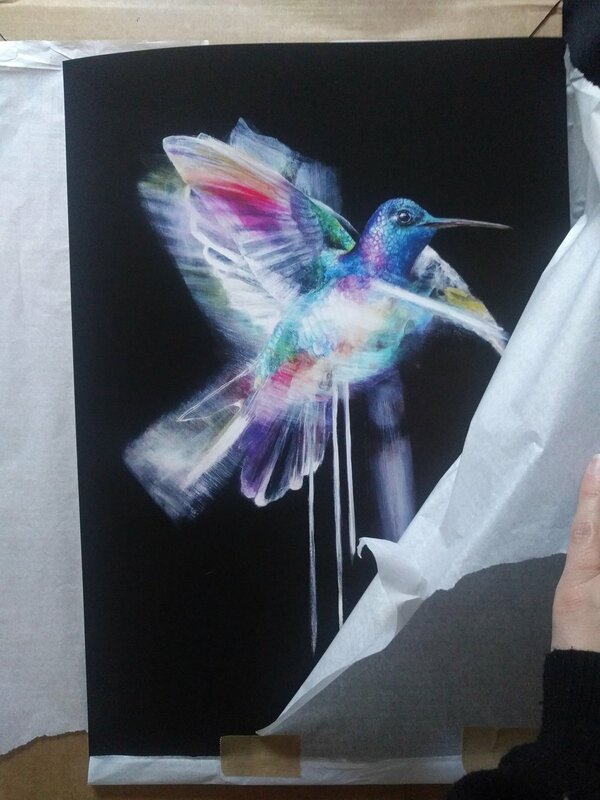 The hummingbird is in flight, breaking away from its form, light and refracted colour act as a mirror to the soul. So, this piece is now available in the print shop! I just had to take a pic as I unwrapped it as I was super impressed by the 'blacker than black' print quality! It really makes the colours pop. Get your hands on a copy here! The lovely Leila Buffery asked a few questions around how spirituality is linked to my creative practice. Enjoy! What's your best advice for getting yourself out of a creative slump? I would question if the work you're doing is fun and exciting. When you get that buzz of excitement from an idea that's the thought you want to hold onto while you're creating the work. If no ideas or inspiration are coming through, chances are you're standing in your own way by having fear based thoughts. These could be around money, around a deadline, around not creating the 'perfect' or 'right' piece, the fear of acknowledging a creative slump and worrying how and if you'll get out. So, what I try and do is take a step back and loosen the reigns. Ask yourself what's the worst that can happen? I say to myself "You're okay, you've got this far in life already." I start reaching for a thought that feels better, like "I've created before, I'll do it again, it's okay if it's not today." Another good tip is to 'Fill the well' as quoted in 'the artists way'. This is a fabulous book by Julia Cameron. It's good to work through as a series of exercises, or just dip in and out of. Remember to look at everything. Look at poetry, photography, nature, listen to a conversation, anything that stimulates that flutter of intrigue. Allow yourself to feel lighter, more playful. That's when the ideas can flow in. Do something for you, that's fun. Don't feel guilty if it's extravagant. Give yourself permission and whole heartedly enjoy it. An idea may pop into your mind when you're not expecting it. As a very openly spiritual person, when do you feel most connected to source energy and a higher power? I feel like the answer should be when I'm painting! But funnily enough it's when I'm running! At the moment, there's lots of boundaries and fears I'm breaking down with my creative practice which is really exciting. I feel connecting to a higher energy and letting it work through me into the artwork on a more conscious level is where it's headed. That said, when I run I get a real sense of clarity. Lots of intuitive answers flow in and I get that tingle all over my body like goosebumps. Then I know I'm onto something good and the universe is working with me. How do you think your spirituality links in with your artwork? We are all spiritual beings and the artwork very much feels like it's moving towards being another means of communication to others. I feel on some level we can all connect through visual art, or sound in a different or even deeper way than language. I feel more and more I am allowing myself to be guided towards what to create, there's a sense it will touch the right people at the right time and hopefully resonate their truth. How do you know how to value your work? I know this can be really difficult for creatives (myself included!) as it requires a bit of a business brain. Yes, it definitely can. I think creating work you love and pouring your inspired energy into it immediately makes it feel of value. I think it's common to have a hangup around monetary value. It can flag up all sorts of challenging feelings. For example, giving things away for free some how represents being virtuous and noble. Putting a hefty price tag can feel greedy. However, these are only our built up beliefs around money. As soon as money is viewed as a form of resourceful energy and neutral energy without the attachments of good or bad, we can see that it's purely an exchange of energy. If you truly value your work, other people will too. Easier said than done, I know! There's always opportunity to give, and sometimes it does feel appropriate. Other times it feels good to receive, which is equally appropriate. This keeps that natural flow of energy moving. Finally, how do you overcome self-limiting beliefs? A good way to test this is if the thought I'm having doesn't feel good, then It's not coming from my higher self. It's invariably fear based. Before that fear totally consumes every ounce of your being, acknowledge the fear, feel the fear, and question it from an observational point of view, as if you are watching yourself. This helps you regain your power and understand what the fear is saying, then, you might be able to laugh at it! If the limiting thoughts have run away with themselves, I find it's better to just stop, rather than power through with forced action. Once the negative thoughts have got some real momentum going, even stopping is a challenge at first. So, I try and stop, break the momentum. I meditate or go for a run and clear my mind. This acts as a re-set button, from this state more neutral or even positive thoughts can get a look in. I then hold onto those more positive thoughts and keep thinking them over an over, before you know it there's an energy shift. Stick with it, any new habit takes time! So, I've launched into the new year with a bang in terms of creativity which is an awesome feeling! Just moved to Manchester from Bath so all change. I love moving, mainly for the fact it gives your mind a big shake up. All that stagnant energy is released and once again, anything is possible! In the midst of the move I started sketching a few ideas, merging old works with new works, drawing, painting, scanning and printing then painting again. I think I had made some subconscious rules around my creativity. This piece is a symbol of throwing all of those rules in the air and returning to the playfulness within creativity. Let's face it, that's where the magic happens! It was so enjoyable and liberating! I'm looking forward to see how this piece develops. This composition flashed into my mind just before I fell asleep. The blue face, the swans with pink tipped wings in front of a golden sun. Yes! It's the first day of spring! “Close your eyes and turn all the way around, slow-w-ly. Sense or feel the open door, the one that offers you ease, that welcomes you to a new homecoming. “Walk up to this doorway, still with your eyes closed. Feel the grain of the threshold under your feet, the doorjamb beneath the palm of your hand. Feel the life pulsing on the other side, offering itself to you. “When you’re ready, step through. Breathe this new air. Feel who you are, in this unknown, deeply familiar place. Feel how you stand, how your feet hold and are held by the ground here. “Feel yourself welcomed, embraced, in all your beauty and timidity, your power and grace. Feel all this place holds for you and with you. “Ask those questions that glow steadily in your heart. “Here are the ones that arise to my lips in this liminal space. “How do I truly love? “What is yearning to be born? “How do I serve now? “How do I love my world now? “Stay here for as long as you wish. When you feel complete, for now, ask this place for a talisman, a reminder that the door is open for you, that welcome and belonging await you there, as they do here. “Turn around, and step back into the present moment, bringing the gifts of this place with you. Place your talisman on your altar, or in the altar of your heart. Kiss it, bless it, be blessed by it. “Write a note, a promise to yourself, to your soul, to your world: This is what I will do to live where I’m being called, to live where I belong. This is a well known quote, but I just felt the need to share. For me it really emphasises the element of choice we have: that our own personal truth can change, depending on the story we want to tell. There's a sense of relief that we're creators of our own lives, that it doesn't just happen to us, that we get to decide the story. Once we decide, it's done. Fear may come along and try to knock us from time to time, maybe everyday! When it does, we can relish in the feeling of what we want as if we have it, as often as we can, until we're spending lots of time with that feeling. It's different to dreaming. Dreaming implies it may never happen. A belief is only a thought that we keep on thinking. It gets stronger and stronger until we feel it. Until we know it. So, there's a comfort in the fact we can change our thoughts at anytime to those that feel better. Granted, this may require a bit of practice, especially if there's some momentum going on a 'nego vibe' hymn sheet. In this case, the reset button is needed. We can sit still and clear the mind. We can become aware of the thoughts that arise as an observer rather than a consumer. I find a good test is: The better it feels, the more in alignment you are with your true self. The self that is connected to all things. The self that is an intrinsic part of this universe. Don't you want to take action and listen to inspiration from that place? So, this piece kind of developed without a plan. I had a rough idea in my mind based on a dream. I tend to think in pictures, the challenge is to hold onto that picture, strengthen it in my mind so I can re-create it. I was thinking about meditation, how there's so much information about 'how' to meditate, how to clear your mind, stop the thought long enough to let the inspired guidance come in. I remember being on a beach with my grandparents when I was four years old. My mama used to say to me "hold the sea shells close to your ear so you can hear the sea"
I remember it so vividly. I was so there in the moment. Looking out at the sea, listening to the sound as if it was magic. Nothing else mattered. Meditation was kind of easy when I was four! The world was a wonderful place and the fears and worries didn't have any longstanding grip. I was in flow of life. With that in mind, I thought, I'm not going to try so hard. There's no pressure on this. I'm going to let the current carry me and see where I end up. This piece has been a turning point, which feels really wonderful. I really loosened the reigns and let go of expectation. I allowed myself to explore, without the pressure of having to create a masterpiece! I had created some pretty tight rules around my artwork. This realisation came when it felt so good to break them! For the first time in ages I got lost. Lost in the flow of creating. I was really there and present in the making of this piece. It reminded me of why I love to create. So Chloe Regan and I had a blast curating our own exhibition at 44AD in Bath. It was super fun and really rewarding. Just catching up and saying a few words on the idea behind the concept of the exhibition.